Preparing students for success is a critical component of the Literacy Lab’s Leading Men Fellowship program. 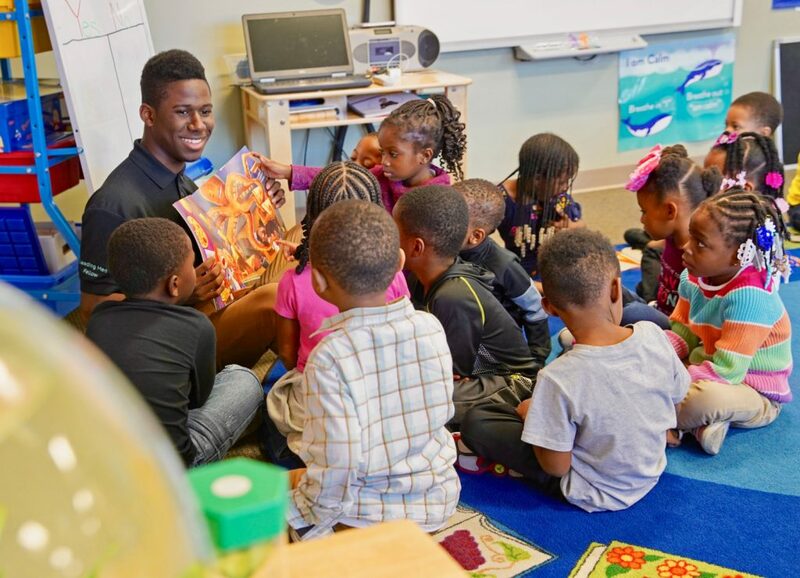 Young men of color receive rigorous ongoing training in research-based early literacy intervention strategies that prepare pre-K children to be successful in school and later in life. Ten fellows — ages 18 to 24 — make up the Leading Men. They commit to working in a pre-K classroom alongside a veteran teacher for the entire school year for 25 to 30 hours a week and earn a living wage of $15 an hour. Once they complete the program, they receive a $2,500 education award to help them matriculate into a postsecondary program. Boys of color are more likely to perform better on standardized tests, attend school more regularly, be suspended less frequently, drop out far less and seek a college degree when at least one of their teachers is of color during elementary school, according to research. As the program manager of the Leading Men Fellowship in Milwaukee, Calvin Lewis knows these statistics well and is leading fellows in the region with support from StriveTogether Cradle to Career Network member Milwaukee Succeeds. 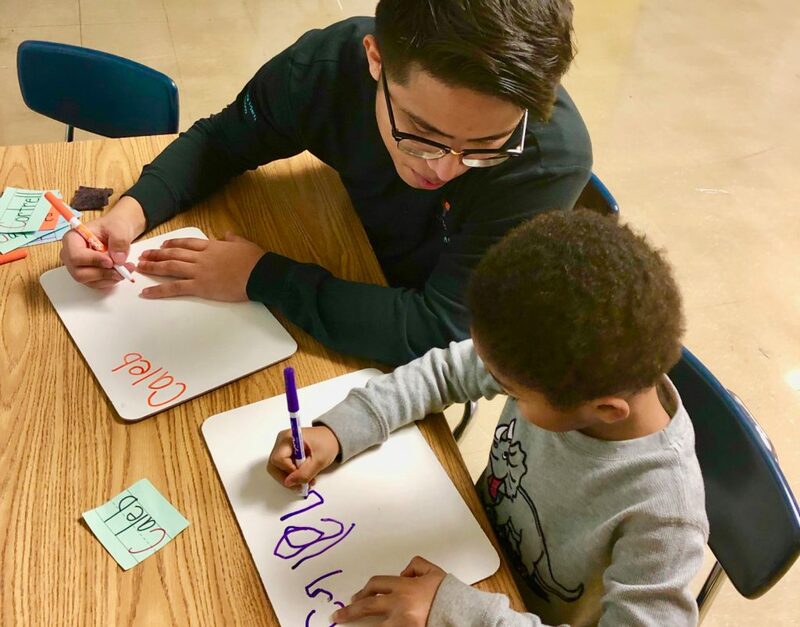 The Leading Men Fellowship began in Milwaukee in August 2018 and is already making an impact by preparing more men of color to teach young children. “In the beginning of the school year, 89 percent of our 4- to 5-year-old students in the Milwaukee region had a composite score that was far below the target measured by the Preschool Early Literacy Assessment. Now students have begun to improve in all assessment areas and 41 percent have achieved kindergarten readiness in alphabet knowledge and 34 percent in comprehension,” Lewis said. Six of the fellows will pursue careers in education. Two are already in enrolled in college and studying early childhood education. Milwaukee Area Technical College serves as the program’s official postsecondary partner and provides the young men with college-level credits for their classroom experience. Five of the fellows plan to continue gaining professional experience as assistant teachers upon successful completion of the fellowship with Next Door Foundation. Others, while not called to become teachers, are exploring other college options. Almost all are first-generation college students. Minority students often perform better on standardized tests, have improved attendance and are suspended less frequently (which may suggest either different degrees of behavior or different treatment, or both) when they have at least one same-race teacher. Kelly Anchrum is senior director of marketing and communication at StriveTogether, responsible for building and leading the strategy and vision of a comprehensive, integrated plan for brand management, marketing and communications.